A century ago, the growth of the Schenk family businesses triggered commercial development and gave its name to Schenk’s Corners. The Huegel surname followed when daughter Elsie married Arthur Huegel in 1910. 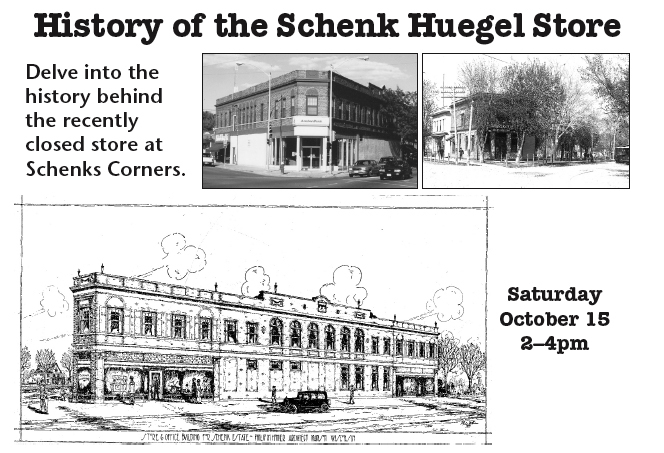 Ann Waidelich (current owner of Art and Elsie Huegel’s house), Sue Retzlaff (Art and Elsie Huegel’s granddaughter) and Wayne Johnson (last owner of the Schenk-Huegel Co.) will present a PowerPoint program of historic photos and recent video about the building and the families from 1893 – 2011. Join us at the Goodman Community Center, 149 Waubesa Street, on Saturday October 15 from 2–4pm. $2 suggested donation. Bob Storck hadn’t heard of the East Side History Club until he was invited to be a special guest by John Olson and Dave Martinson when they presented their program on East High School athletes in the 1960s at the May 2011 meeting. Bob graduated with the class of 1969. He was All State in football and Al Conference in baseball and played on the defensive line for the UW Badgers football team..
Another athlete who was a guest was Jackie Zoch, a member of the Class of 1967, who rowed for the UW Badgers and won a bronze metal in rowing in the 1976 Olympics. Bob hadn’t met Jackie until the day of the program and he was excited to meet an Olympic champion ! Bob, his wife Colleen and Jackie went for a beer after the program to get better acquainted. She told him she was still rowing on Lake Mendota. He said he had never tried rowing and was inspired by her stories of the UW crew and her training for the Olympics. He joined the Mendota Rowing Club and has enjoyed the, “new” to him”, sport of rowing. You never know what a chance meeting at the East Side History Club will turn into.